RUMORUM sounds the source. 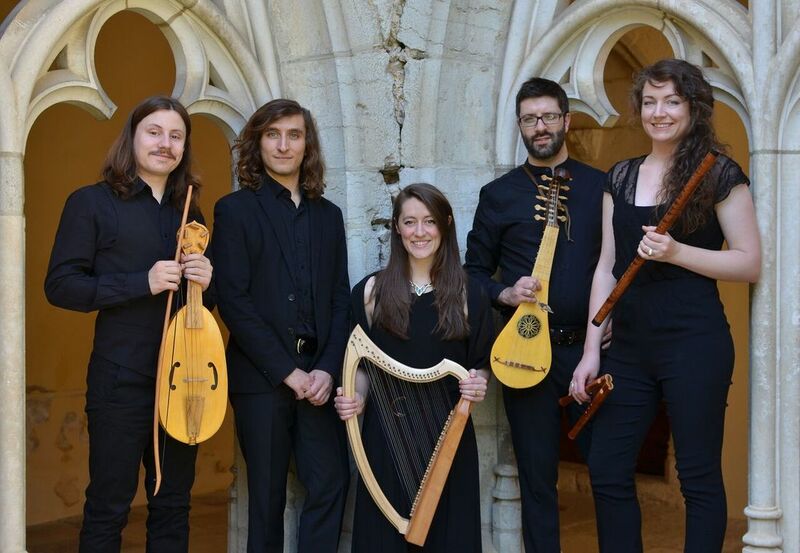 Passionate about engaging with the enigmatic imprints of past cultures, the ensemble brings medieval music to the modern concert stage in an honest, artful, and historically sympathetic way. Alongside the performance of long-revered medieval repertoires, the ensemble fills gaps with informed compositions and stylistic improvisations, and, in internalizing texts and forms, draws upon memorization to create transparency between act and audience. The voices of RUMORUM revive the beauty of sung and spoken poetry, and the group has developed an instrumentarium that is harmonized from a colourful web of frescoes and manuscript marginalia. Concert and festival appearances have included a WDR3 radio concert for the Tage Alter Musik in Herne 2016, the Rencontres Internationales de Musique Médiévale du Thoronet 2017, and a concert tour for the Organisatie Oude Musiek in Utrecht 2018. Their performances have so far taken them to France, Germany, Belgium, the Netherlands, England, Italy, and Switzerland. The group is currently in its second year of endorsement through the EEEmerging scheme (Emerging European Ensembles). Each member of RUMORUM has enjoyed higher-education training in medieval music theory, notation, improvisation, and performance practices. Alongside well-known and loved medieval repertoires, the ensemble brings historically-informed new compositions, improvisations, and performance practices to their concert programmes. RUMORUM met and formed whilst studying medieval performance at the Schola Cantorum Basiliensis in Switzerland. The group was soon after selected for the Laus Polyphoniae International Young Artists Presentation in 2015 (that year dubbed the International Petrus Alamire Lab), and was subsequently taken to perform at AlbaNova Festival, Bruges Fringe Festival, and Utrecht (Fab) Fringe Festival in one season. In the same year, RUMORUM was a finalist in the prestigious St John’s Smith Square Young Artists competition, and in 2017, the ensemble was a finalist in the York Early Music International Young Artists Competition, where it was awarded both the EEEmerging prize and the Friends prize. In the same year, RUMORUM was selected as one of five young ensembles for the Brighton Early Music Festival Live! ​scheme in the UK. The individual members of RUMORUM are hired independently by renowned medieval ensembles. Guests have included Lucinda Cox, Hanna Marti and Matthias Deger.